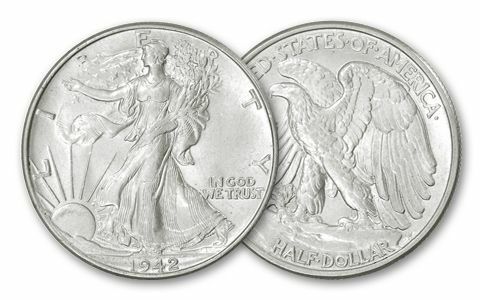 As good as new, more than 68 years later: WWII Walking Liberty Half-Dollar! The year after the U.S. entered World War II in December 1941, a postage stamp would have cost you 3 cents … a minimum wage job paid 30 cents an hour … and when you could find it, gasoline was 19 cents a gallon - as long as you had enough ration coupons! Money was tight. But jingling in pay packets and pocket change across the country was one big silver coin with real buying power: the Walking Liberty Half-Dollar! 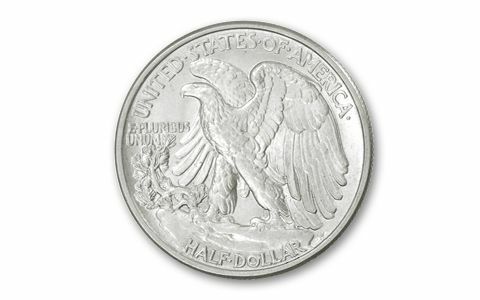 Now considered to be one of the top three most beautiful U.S. coins ever made, the Walking Liberty Half-Dollar was the largest circulating 90% silver coin struck between 1941 and 1945. But following those anxious years of rationing and shortages, many were melted for their precious silver or simply wore out in circulation. So finding any quantity of Walking Liberty Half-Dollars today – 68 years after they last rolled off the presses – can be a challenge. 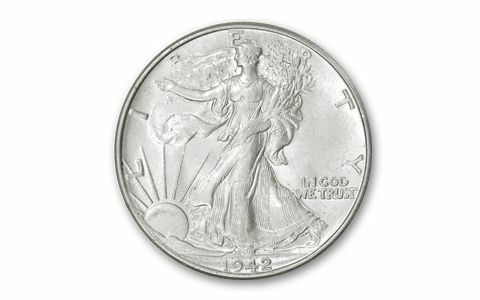 Walking Liberty Half Dollars are the coins that our parents and grandparents would instantly remember spending for groceries or a tank of gas in the 1940s. The classic American design is so beautiful – and so beloved – that the U.S. Mint chose it to reappear on every U.S. Silver Eagle struck since 1986. It's definitely a coin that no U.S. coin collection (or Silver Eagle collection) should be without! But it’s not often that we find a common circulating coin from the war years in pristine Brilliant Uncirculated (BU) condition – let alone this many! While our small quantity lasts, you can own one of these iconic WWII Silver Half-Dollars for less than $80 each! Just don’t wait – they’re sure to go fast!